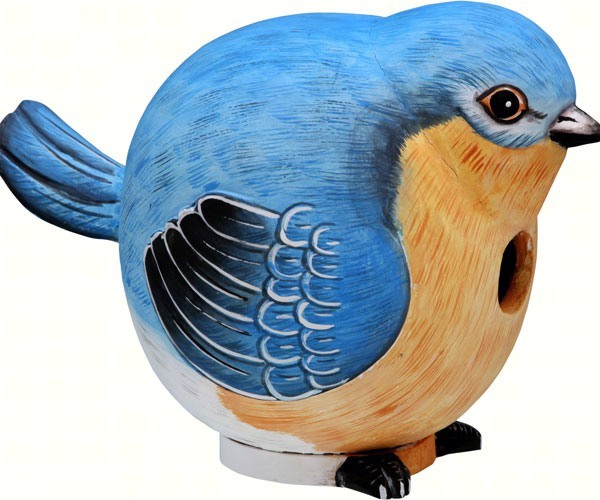 Unique Hand Carved Bluebird Gord-O Birdhouse-BEST PRICE! This cute and beautifully detailed bluebird birdhouse adds color & whimsy to any garden and comes ready to hang under the canopy or on a tree. Hand-carved from Albesia wood, a renewable resource, each birdhouse is hand painted with non-toxic paints and coated with polyurethane to protect them from the elements. By using all natural and nontoxic components the artist has created a safe environment complete with clean-out for our feathered friends. We have included hang tags featuring our green source & product care.